By: Demetrios Salpoglou Boston is a city rich with history, and with history often comes hauntings. After all, nearby Salem is where the famed Salem Witch Trials took place in 1693. Even before that, Captain John Smith sailed into Massachusetts bay, bringing disease that killed nearly half of the area’s local people. The city’s sordid past — and it’s trapped souls — are still alive, giving locals and tourists alike some of the most frightening experiences of their lives. Don’t miss these top five most haunted places in Boston. This haunted hotel is perhaps the most acclaimed in Boston — and the most frightening. Guests too timid to stay in one of the rooms can have dinner at the Parker House restaurant, but we highly recommend you make a reservation. The hotel has an elevator that stops on its own at the third floor, where an actress died in 1876. Guests have reported seeing Charles Dickens in a mirror in the mezzanine, and the ghost of the hotel’s owner Harvey Parker haunting the halls. Lizzie Borden, the singular suspect of the horrific double murder of her parents in 1892, lived in what is now a bed and breakfast museum. Although the house is about an hour outside the heart of Boston, it’s worth the trip. You can stay in the John Morse room where Abby Borden was found murdered, or in one of the other seven historic rooms. Take the house tour and visit the living room where Andrew Borden’s body was found and the couple’s grave sites. Many guests leave the inn, unable to stay through the night. 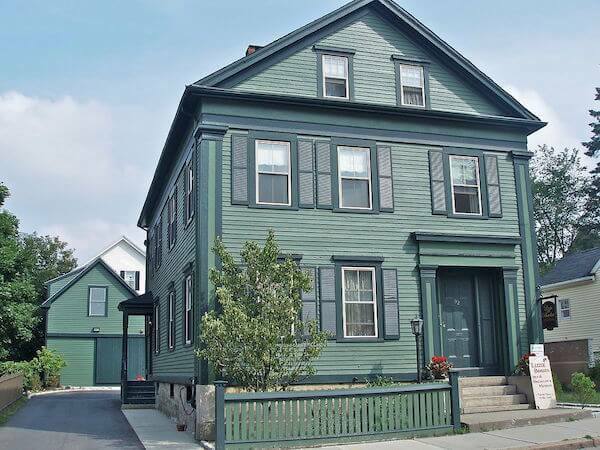 Creaking floors, doors opening and closing on their own, and shadows walking up the staircase are regular happenings at the Lizzie Borden house. Granary Burying Ground isn’t just any old cemetery. Here lies the bodies of John Hancock, Samuel Adams, and Paul Revere to name a few. There’s a mass grave for victims of the Boston Massacre and another for children. If the old, historic headstones aren’t creepy enough, stick around. Visitors report seeing spectral figures, orbs, and other apparitions, particularly at night. Many people have reported seeing the ghost of a soldier in the Revolutionary War, who is thought to be attorney James Otis Jr.
A visit to the most haunted places in Boston isn’t complete without a quick trip to Salem, home of the famed Salem Witch Trials. While there are plenty of spooky tourist attractions, the real activity is over at the Hawthorne Hotel. The property was once an apple orchard that was owned by Bridget Bishop, one of the first women to be executed in the trials. The smell of apples often permeates the building, and guests have seen a a female apparition pacing the halls. The sounds of babies crying, lights and faucets turning on and off, and the feeling of being touched are not uncommon in the Hawthorne Hotel. Stay the night in the most active rooms — 612 and 325 — if you dare. The Berklee College of Music has a haunted dorm that was once an apartment building turned hotel. In 1963, a boy playing with matches caused the hotel to catch fire. Several lives were lost and students say their spirits remain, unable to find peace in the afterlife. Students frequently see apparitions and hear odd noises in the dorm. Once, a television flew across the room. If you’re brave enough to tour these famous haunted places in Boston, be sure to take photos and tell your story. Many people who considered a visit uneventful see strange orbs, faces, and other apparitions in their photographs!